When it comes to well-being, many organizations consider employees’ physical and mental health, offering health insurance and other benefit programs. Financial well-being is less often considered, but it can make a big impact for both employees and employers. More than any other kind of debt, student loan debt causes workers to have less favorable views of their own financial well-being, according to William Elliot, director of the School of Social Welfare for the University of Kansas. How can organizations improve their employees’ financial well-being? 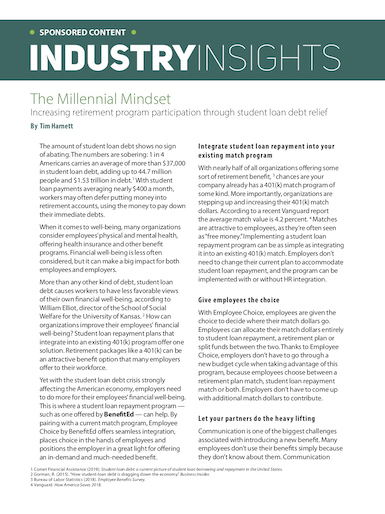 Student loan repayment plans that integrate into an existing 401(k) program offer one solution. Retirement packages like a 401(k) can be an attractive benefit option that many employers offer to their workforce.